Also Recommended: Girls und Panzer, Taishou Baseball Girls, Bakuon. Notes: This is an original anime created by Silver Link as their 10th year anniversary project. Miyake Island is a hotspot for motorcycle sidecar racing, or "kneeler racing" as it's known in this show, where winners are often allowed to move on to the famous Isle of Man TT race event. The cycles in question are a particular type of flatbeds that don't really resemble more classical motorcycles a whole lot. Yuri Miyata and Megumi Meguro are two residents on Miyake, who also are members of the sidecar club. The two are almost constantly at odds with each other, with the main reason for that being their coach, whom they also both fell in love with. When he left for Isle of Man TT himself, the two girls woved to make it there some day. I don't necessarily mean to make every review where women do anything into a treatise on gender politics, but I did check, and indeed, there are women competing in sidecar racing. It did face its share of sexism back in the sixties -- like so many other things, I'm sure -- but women seem to be fully accepted as racers now, even highly encouraged, with a wish that more women would take interest in this particular sport. Especially with the Isle of Man TT race, which is supposedly one of, if not the, most demanding courses you could ride. 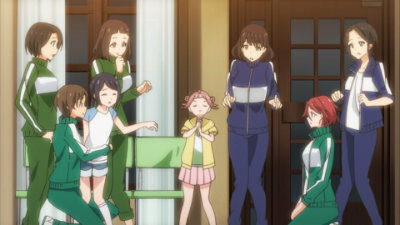 Of course, shows with girls taking up a hobby or participating in a sporting event has become so commonplace in anime that I didn't really think too much about it when I started watching Two Car. I was in it for the bikes and, to some extent, the girls, and it's always nice to see a combination of two things I enjoy at any point. Wary about shows with cute girls and nothing but, I was still apprehensive, but thankfully, Two Car does a good job at handing out more than enough material on its main subject. In addition to our main twoesome, sidecar racing teams from all over Japan is arriving to take part in this race, and a lot of time is spent on doing bike shakedowns, adjustments and generally getting used to the course. It's the part of the show I rather enjoyed, even after everything was said and done. 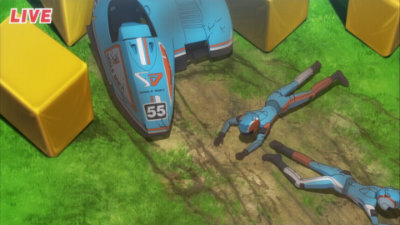 The animation, while not top-of-the-shelf material, still makes the racing sequences work. The scenery in general look great, and even the high-speed parts blends the CG bikes with the backgrounds surprisingly well, with only a few small hiccups that move a bit awkwardly, not nearly enough to ruin the show's visuals. The sound effects also makes the show work, which is important in a show like this. The soundtrack is relatively unmemorable, though, and it's got an ungodly boring opening theme. It's good that the show makes the racing work, because as a drama or a comedy, it's... vastly less successful. Wanting to be dramatic, the show has all the various teams face their inner demons (so to speak) during their stay at Miyake Island. Given that all the girls there have worked up quite a talent for that sort of thing, I don't think it's unreasonable to think that they've spent a few years doing this, yet save for one of the teams -- Chiyuki Shiohara and Misaki Nagai, who seems to have worked out their differences long before arriving here (and as such was told through a flashback instead) -- the various teams somehow have all their issues worked out one at a time as the show moves along. Granted, part of that can be excused since you're basically putting together a large group of people and then separating each team into the driver group and passenger group, and it's not unheard of that someone would dwell on comments made by the others who are either curious or, in the case of team Alsvid, mildly unsettled by a team relationship. 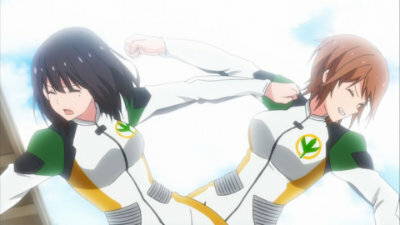 The other teams are considerably less dramatic, especially Hitomi Iseki and Mao Katakura of "team Segsugekka". 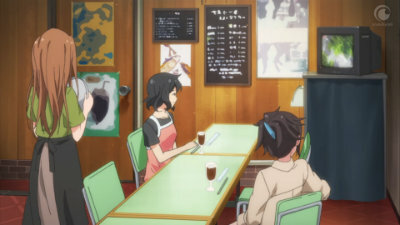 (Mao is supposedly a "crossdresser", whatever that means in this show.) They spend almost every single moment of their onscreen time reminding you how perfectly in sync they are, and anyone who thinks otherwise are obviously insane and wrong. 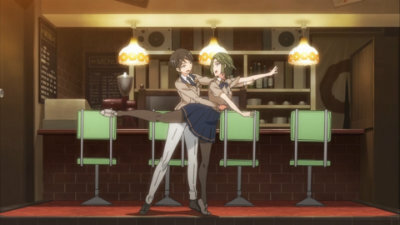 I suspect said comedy is meant to poke some fun at the expense of shoujo romance between "destined" couples, which I would normally be all for, but comedy needs to be mixed up some. Don't just repeat the same joke over and over and over with slight variations in anything except the actual punchline. And that's not even getting started on our main team, Ashitabamaru, with Yuri and Megumi filling the seat of driver and passenger respectively. They're the locals of said island, and they got started on all of this at the urging of their coach during their first year at high school. 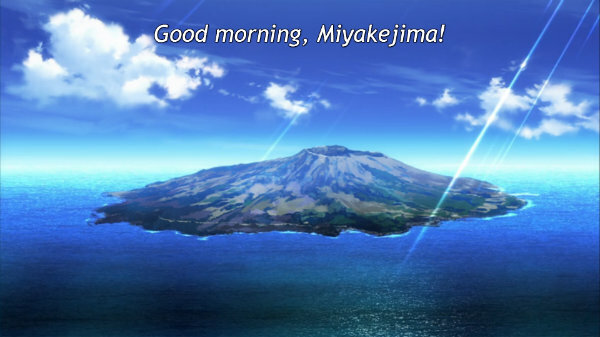 (Although with Miyakejima being the hotbed of racing, the interest itself got started a lot earlier than that.) The problem is, they both fell in love with the guy, and that was the point where they started bickering more or less constantly. Their first fight onscreen is literally lampshaded with "you two never change", and I really hope you find people arguing over everything funny, because they do just that. If you don't, they are liable to get on your nerves really, really quickly. They do work well together when they want to, but their personalities make them very hard to root for. It's the kind that goes a bit beyond "flawed personalities" into "comically assholish". And comedy is quite subjective, no? Like most shows that want to be dramatic, things get turned up quite a notch near the end. Their coach, who had gone to the Isle of Man TT, returned and -- if you'll forgive me the spoiler -- introduced his new fiancee to the girls. This lead to the remaining two episodes nearly making me facepalm myself into oblivion, particularly since the show chose to apply a "situational reset" at the very end when I actually hoped our main duo would get a chance to mature some. But no, all of that was blown up near the end, and we were all placed back at step one, with nobody getting to claim their 100 dollar's worth of personal development. For a show that seems to want to promote change and maturity in the face of challenges, it seems almost mortally afraid of any of that. 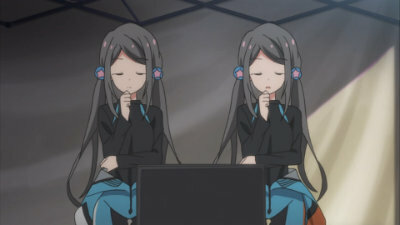 It's a shame the characters -- well, that is to say most of the racers -- in the show are such irritating tools for drama as they are, because the racing aspects are fun, as is the whole media event spearheaded by the broadcasting club, its commentator in particular. Ai Makita goes from being an almost emotionless deadpan girl to a veritable female teenage Robin Williams in Good Morning Vietnam with the way she speaks. She's also the recipient of the only other "personal development through a flashback" episode the show has, and in all honesty the only part I liked with all my heart. Which is not to say I disliked the other girls in the show. 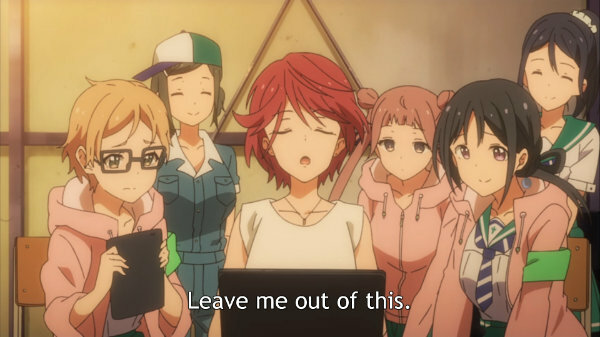 I just got tired of the arguing between Yuri and Megumi really quickly, as did I the comedic way Hitomi and Mai gushed over their compatibilty in addition to the aforementioned Alsvid girls' creepy and unhealthy relationship. Hell, even the whole situation with the twins felt more like it went out on a limb before returning from said limb back to square one, as if nothing really had happened outside of their desire for a new haircut. That extends to the characters of Tina and Betty Birchall, two female top contenders in the Isle of Man TT racing and certainly not based on Tom and Ben Birchall -- the winners of the Sidecar World Championship in 2016 and 17 -- at all, seeing as the show makes sure to point out that this is a work of fiction and none of the characters have any relation to actual persons. It also says the same about places, but the Isle of Man TT race is pretty famous, right? There's absolutely no reason to be coy about that, I think, given the theme of the show itself. 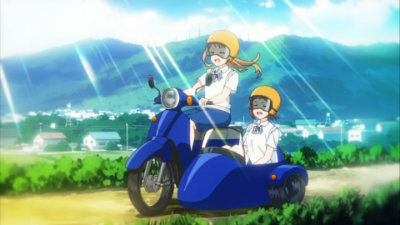 Strike Witches never saw any problems with having the girls be based on real-life pilots, and that was a show with far less seriousness on its plate than Two Car. So what rating to give this show? 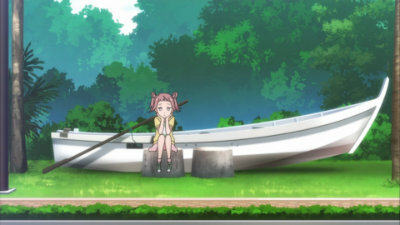 As I mentioned, I rather liked the racing part of the show, and the supporting crew basically looked on the antics of Yuri and Megumi as something they'd just have to deal with, although not without some consternation, and by the end of this show, I certainly know how they feel. The team mechanic of Ashitabamaru in particular impressed me at the end, when she had to come up with some mechanical alterations on the fly due to circumstances beyond anyone's control. In my eyes, she really is the hero of this story. The severely underappreciated hero. Couldn't agree more. And thankfully, that's an action I can choose to back up, should more of this be made. 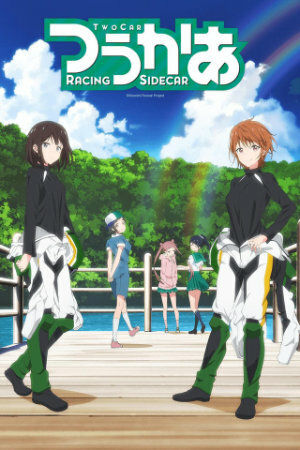 On the side of fanservice, you'll get to see a lot of girls in tight racing suits and in various... interesting positions -- these are flatbikes, after all -- to the point where the many, many times you see the girls in the big outdoor baths is almost the less fanservice-ish parts of the show itself. Two Car © 2017 Silver Link.